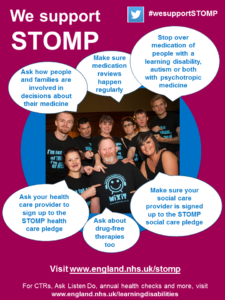 STOMP is a medication related project run by NHS England for people with a learning disability and/or autism. It is about ensuring that people get the right medicine if they need it and that people get all the help they need in other ways as well. It stands for Stopping Over-medication of people with a learning disability, autism or both and it aims to improve people’s quality of life through appropriate use of medication and other ways of supporting vulnerable people. People with a learning disability and /or autism suffer from mental health illnesses, such as schizophrenia and bipolar disorder, at the same rate as the general population. In addition they are likely to suffer from a huge burden of physical ill health such as respiratory and cardiovascular illness. Much of this is thought to be preventable with the right help and support from healthcare services. Unfortunately, people have a significantly reduced life expectancy, up to the order of 20 years, especially in women. 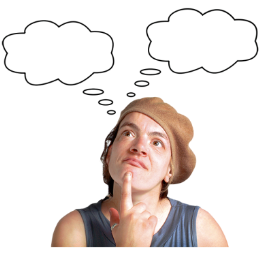 People with a learning disability and/or autism are also often labelled as having behavior thought to be challenging, such as being verbally and physically aggressive to others or injuring themselves. In the past, doctors have used powerful medication to “manage” this behavior despite there being little evidence to show that they work. Some of these medicines are used for serious mental illness and can cause a huge range of side effects such as sedation, weight gain, dizziness and stiff limbs. STOMP aims to tackle all of these issues to ensure medication is used wisely, reviewed regularly and removed when no longer needed. This should ensure a person is kept safe and well and enjoying the best possible quality of life. The project is about encouraging people to have regular medication reviews, supporting health professionals to involve people in decisions and showing how families and cares can be involved. STOMP also aims to improve awareness of non-drug therapies and practical ways of supporting people whose behaviour is seen as challenging. This is where behavioural nurses play a key role in helping the person and their circle of support to think about a person in different ways and to understand why there may be challenging behaviour. They can often support a person without the need for medication which means they don’t suffer from a range of unwanted side effects. In 2011 a BBC documentary unearthed a horrendous scale of abuse in Winterbourne View care home showing that many people with a learning disability receive powerful psychotropic medications to manage and prevent behaviour that challenges. It is estimated that up to 35,000 prescriptions per day, for psychotropic medications, are issued to people with a learning disability who do not have a serious mental illness. While some medication use may be needed in selected cases, it is felt that much of this prescribing could be inappropriate and needs to be reviewed. Psychotropic medication includes antipsychotics, antidepressants, and antiepilepsy medications used to stabilise a person’s mood. NHS England set up a small STOMP team in 2015 and they have been working to raise awareness of the issue. A key theme of the work is to engage with the experts – people with a learning disability, autism or both and ask what they want from STOMP. The team work with a number of advocacy groups and family carer forums including the Challenging Behaviour Foundation to allow people to understand what STOMP is trying to achieve. In 2016 the team linked with the Royal Colleges for Psychiatrists, GPs, Nurses, Psychologists and Pharmacists to ask them to sign up to STOMP and to pledge their support for the principles. All bodies are working to help their members deliver meaningful change in people’s lives. This has been expanded to include several other organisations including Speech and Language Therapists, Occupational therapists, Physiotherapists and many Arts therapists. In 2017 the team expanded the STOMP pledge to all social care providers, organisations who provide specialist care for people with a learning disability and/or autism. They committed to train all their staff to recognise and challenge inappropriate medications and to support the person they care for to achieve the best life possible. To date over 160 organisations have signed this pledge. 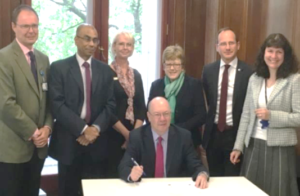 Not content with stopping at social care providers the team launched another pledge for healthcare providers to again commit to STOMP. These are NHS trusts and private organisations who care for people with a learning disability and/or autism as in-patients in hospital and as outpatients in community. This launched in 2018 and to date 80 organisations have taken the STOMP pledge. THE STOMP PLEDGE: Both health and social care providers aim to deliver the same commitments as shown. As STOMP is across the full age range from children to old age another Pledge launched in December 2018 aimed at children and young people. The STOMP-STAMP pledge focused on exactly the same commitments as the other pledges. Outside of the pledges the team have worked with Family Doctors and Commissioners to ensure they are aware of STOMP. They have also linked to the Care Quality Commissioner (CQC) who inspect all types of services and they are committed to ask questions about STOMP progress. Much hard work has been put into the STOMP programme to ensure people have the right kind of care, support and medication to keep them safe and well. It takes time and effort to deliver but the principles of improving people’s lives challenges everyone to sign up and deliver, no matter where they work. The STOMP principles will continue to develop over the coming months and years and hopefully more people with a learning disability and/or autism will benefit from better care and support and to live more meaningful lives.